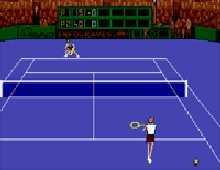 Advantage Tennis is a fun tennis game by Infogrames that is a cut above average tennis games on the market. The idea is simple: starting at the bottom of top 100 players chart, you must defeat higher-seeded players toward the goal of –what else—being the best tennis maestro in the world. One of the game’s highlight is the use of 3D-rendered graphics to portray the players as well as the tennis court. While this technique does not allow the same range of realistic movements as 4D Sports Tennis, the effect is still very good. The “intelligent” camera that moves during the match to track the action is a great idea, and adds a lot of atmosphere to the games—at times you will feel like watching a live broadcast of a tennis match. A full range of options including career tracking, practice match, and tournaments on various types of courts completes the package. Overall, Advantage Tennis is a very fluid and enjoyable game. The controls take a while to get used to, but if you take the time, you'll end up having a great alternative to Tennis Cup 2. Highly recommended!